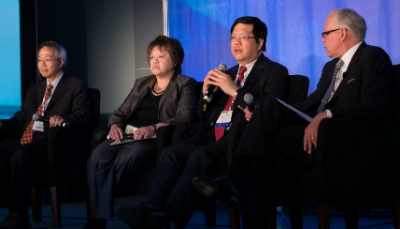 At the recent ASCD Annual Conference in Los Angeles, Calif., ASCD Executive Director and CEO Dr. Gene R. Carter convened an international panel of education leaders from Hong Kong, Singapore, and Canada. Although their contexts differ, they share many of the same challenges as U.S. educators, and their global perspective provided a new lens for considering common themes in education. Here were some of the panel's responses. Daniel Tan Tiong Hok, director of the Centre for Excellence in Learning and Teaching, Nanyang Technological University, Singapore, identified technology as the major source of rapid change in education. Technology shifts teachers' roles, so they are no longer the source of all information, and enables students to be cocreators of learning. "Google is not bound by a syllabus," Tan noted. "Students seeking information on their own will go beyond the syllabus, and possibly, beyond what the teacher knows." Donna Quan, director of education, Toronto, Canada, warned that, in general, "We run the risk of being a society that is more tool-centric than person-centric." If that happens, she fears we will lose the essence of education: to prepare responsible, humane citizens. "Tools can never teach humanity, relationships, or character. There is no greater value in learning than being taught by another person," she concluded. Tan added the analogy that "If you're sick, you might go to Web MD to check your symptoms, but you still want to be seen by a doctor." Edmond Hau-Fai Law, associate professor at the Hong Kong Institute of Education, attributes Hong Kong's high academic ranking to the open nature of Hong Kong society and the different religious communities shaping the area's public schooling. But, he lamented, Hong Kong is not immune to the influence of tests, and the subsequent narrowing of the curriculum. "We take it very seriously that tests shape and restrict curriculum. In the last 30 years, we've been trying to reorient tests toward formative, performative, and school-based assessments," he added. Quan described how teacher prep is expanding in Toronto—master's programs are extending to two years and teacher induction programs are blooming to provide beginning teachers (for up to three years) with mentors, release time to visit model classrooms, and strategies for attending to the tenets of a whole child education, not just focusing solely on academics. Law mentioned improving teacher capacity and sustainability within a profession that is already stretched thin; Quan said the widening poverty gap was a big concern; and Tan said his country is challenged to provide professional development that has a more holistic perspective on the purpose of education and student development, beyond academics. Follow the Whole Child Symposium conversation here on the blog, share your thoughts in the comments and by e-mail, and pose your questions on Twitter using the hashtag #WCSymposium2014.